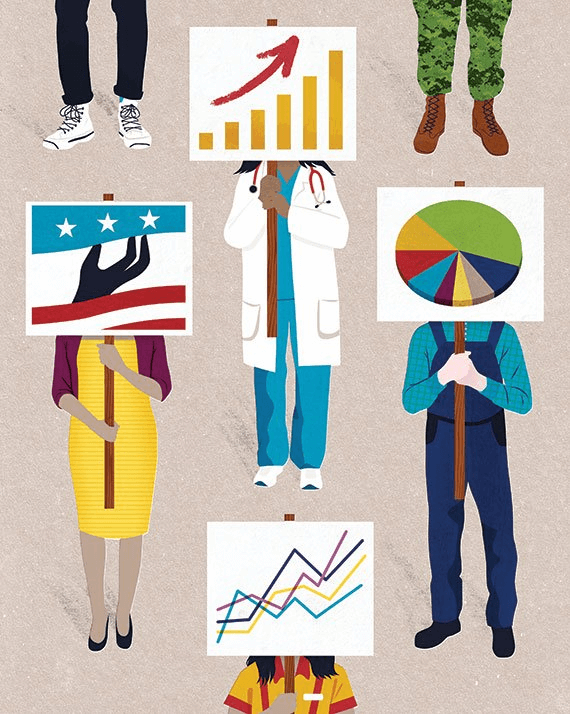 For many foundations, collaboration is key to advocating for policy and practice change. But these kinds of partnerships can be challenging to execute well. "Sticking points", like conflicts over decision-making power or competition for resources, can derail advocacy-focused efforts and make even the most earnest collaborator wary. This collection brings together 40+ reports and reflection pieces about multi-party advocacy efforts; providing valuable perspective on both the sticking points and how we might move through them. The collection was created as a complement to a related set of resources on the same topic from our sister site, GrantCraft. The crises affecting our nation and the world are requiring foundations to become more organized, focused and responsive in their efforts. The work of social justice is complex -- and a traditional, siloed approach from philanthropy will not bring about transformational change around issues that are so inherently intersectional. Advocacy groups deeply ingrained in communities understand this all too well, and they often work to address multiple issues simultaneously; they face real challenges when they feel pressured to make their work "fit" into the context of a grantmaker's preferred issue. 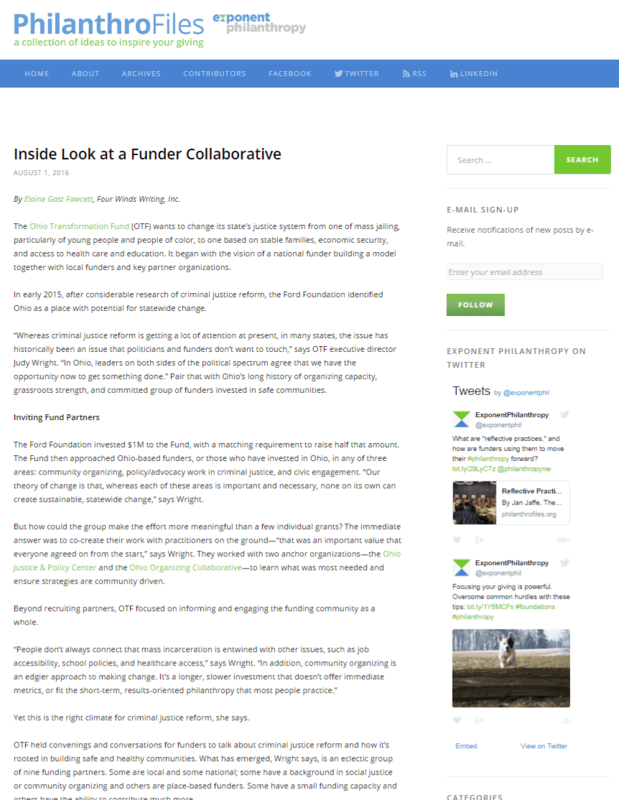 This narrow approach from funders can negatively impact the ability of these organizations to do the work necessary to truly affect change – and ultimately, it limits the effectiveness of philanthropy, as well. One approach to moving beyond a single-issue focus is to join efforts with other foundations to leverage the reach of our support. Immigration Project partners gather and share economic data on immigrants on a wide range of indicators, including ethnographic makeup and average earnings. Collaboration (funding and research) makes it easier for anyone new to the immigration debate to dive right in. Expert fiscal analysis provides a solid grounding for many of the policies that are being championed, such as letting undocumented immigrants get legal drivers' licenses or making them eligible for in-state tuition at state colleges and universities. The groups do the "wonky analysis with lots of footnotes," gauging the economic contributions of immigrants, both legal and undocumented, across the country, and then they do the social math, putting the issues into terms that people—especially lawmakers—can understand. The Ohio Transformation Fund (OTF) wants to change its state's justice system from one of mass jailing, particularly of young people and people of color, to one based on stable families, economic security, and access to health care and education. It began with the vision of a national funder building a model together with local funders and key partner organizations. In this interview, Geri Mannion of Carnegie Corporation of New York shares her thoughts about the biggest challenge facing the country this election year and the role of capacity building in supporting civic engagement. She also offers practical tips for funding state-level efforts to change policy and engage communities. The police killings of Michael Brown and Eric Garner and the decision by respective Grand Juries not to bring forth criminal charges unleased the anger and energy of Black communities across the United States. Black philanthropists were not immune to this moment and today, collectively and individually, we struggle to better understand our roles. 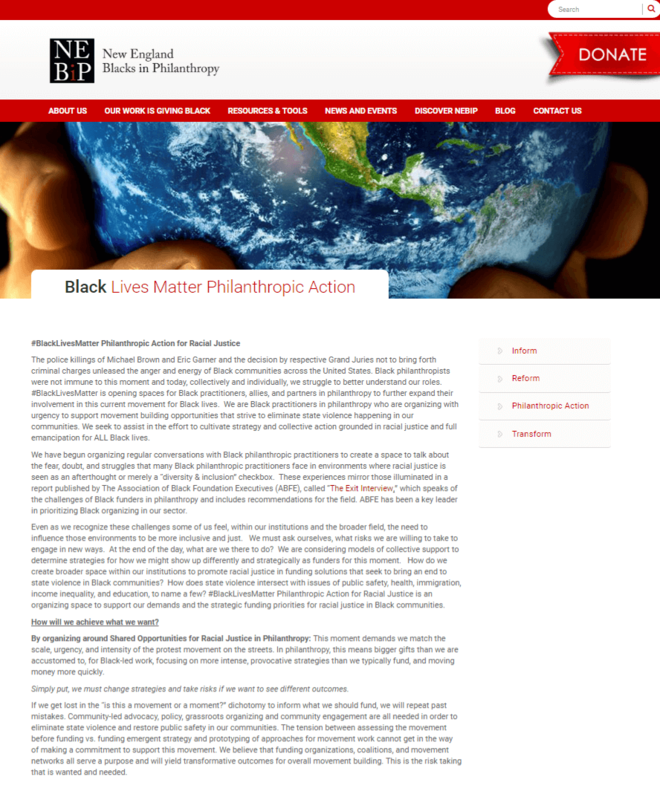 #BlackLivesMatter is opening spaces for Black practitioners, allies, and partners in philanthropy to further expand their involvement in this current movement for Black lives. We are Black practitioners in philanthropy who are organizing with urgency to support movement building opportunities that strive to eliminate state violence happening in our communities. We seek to assist in the effort to cultivate strategy and collective action grounded in racial justice and full emancipation for ALL Black lives. 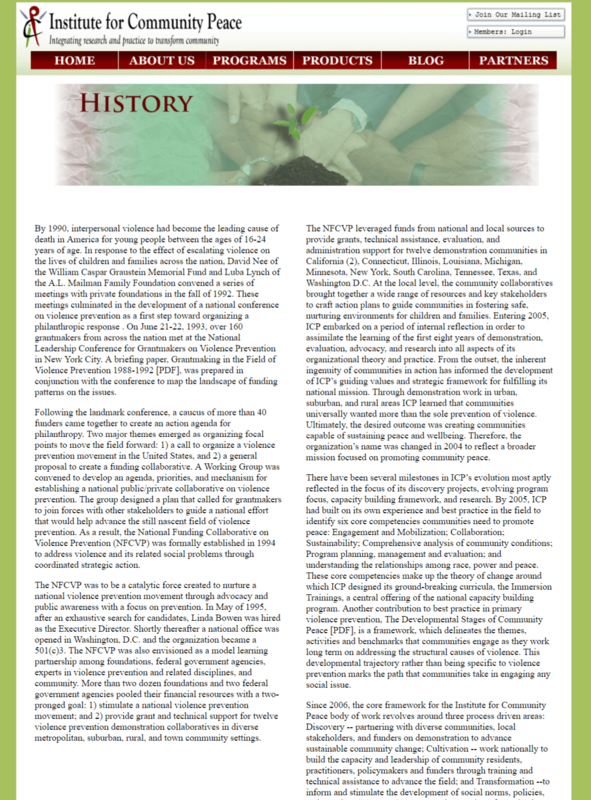 A short history on the National Funding Collaborative on Violence Prevention. At times I step back and look at the BHC initiative and wonder, Could we have made it more complicated? Fourteen sites. Multiple grantees in each site. A core set of inter-linked health issues. Multiple state-level grantees. And the expectation that the parts will add up to something greater than the whole and catalyze a convergence that builds power at the community level and leads to greater impact.But then supporting an agenda for social and community change requires multiple strategies operating in alignment; good data, message framing, and storytelling; influential messengers and convening and facilitating champions; innovative models; "grassroots and treetops" coordination; and meaningful community engagement. The examples of advocacy that inspire me are the ones that take seemingly basic issues, drill down to examine root causes and barriers, and then work to remove those barriers. The following two stories of philanthropic advocacy come from Minnesota grantmakers—the Northwest Area Foundation and the Blandin Foundation. The success of these projects can be attributed to the unique collaboration that brought donors, nonprofit agencies, community organizations, and policy makers to the same conversation to find solutions to a community problem. 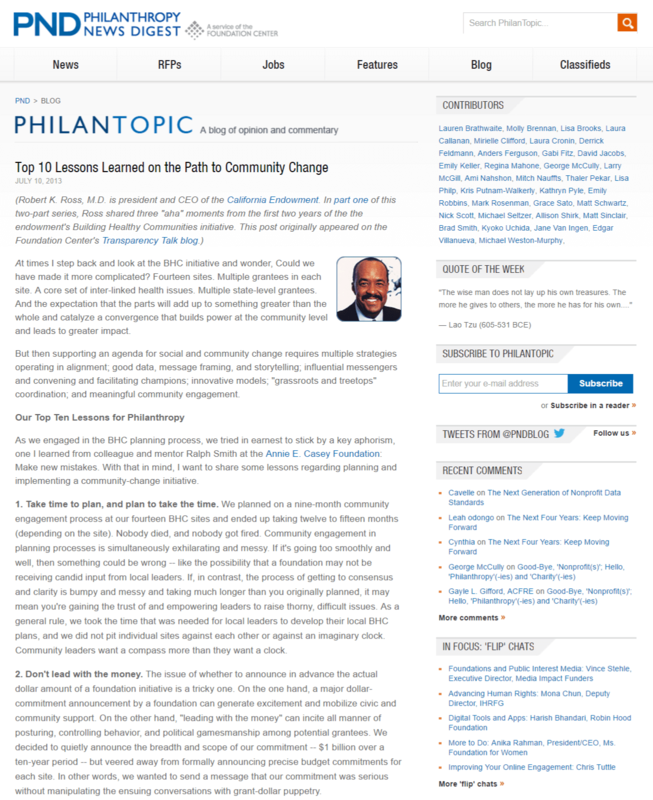 By bringing multiple voices to the table, these philanthropic organizations found that their funding efforts went further to achieve innovative, large-scale, and lasting solutions. Although foundations aren't known for joining forces, in some circumstances partnership more than pays off. A good example is the Four Freedoms Fund, launched in 2003 to energize American democracy by actively supporting and engaging the country's newcomers. 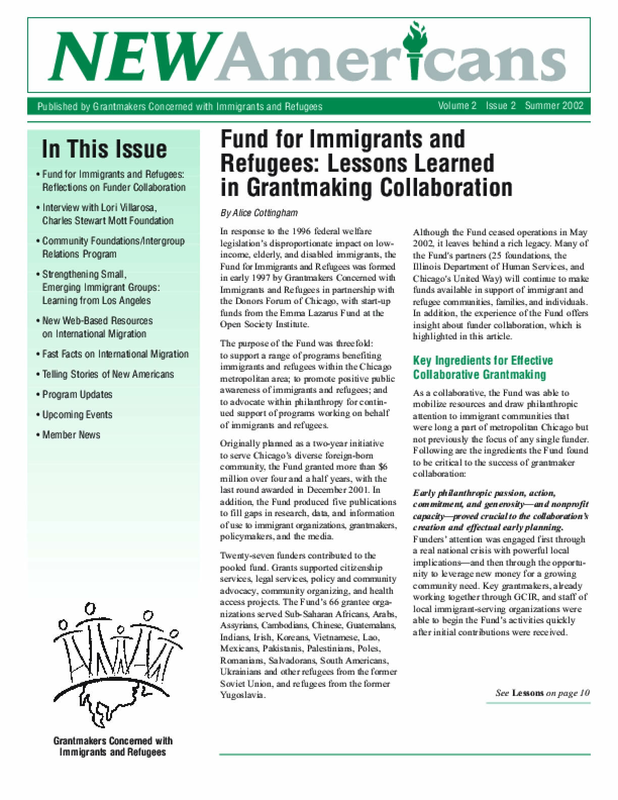 Its founding members, Carnegie Corporation, the Ford Foundation, Open Society Institute, the Mertz Gilmore Foundation and John S. and James L. Knight Foundation1, national funders who had all been working individually on behalf of immigrants, took the unprecedented step of combining their funds and developing a joint strategy to support immigrant advocacy at the state and local level. "It was a way to be more responsive and strategic, and most importantly, to get more bang for the buck," says Geri Mannion, Carnegie Corporation program director, U.S. Democracy and Special Opportunities Fund. 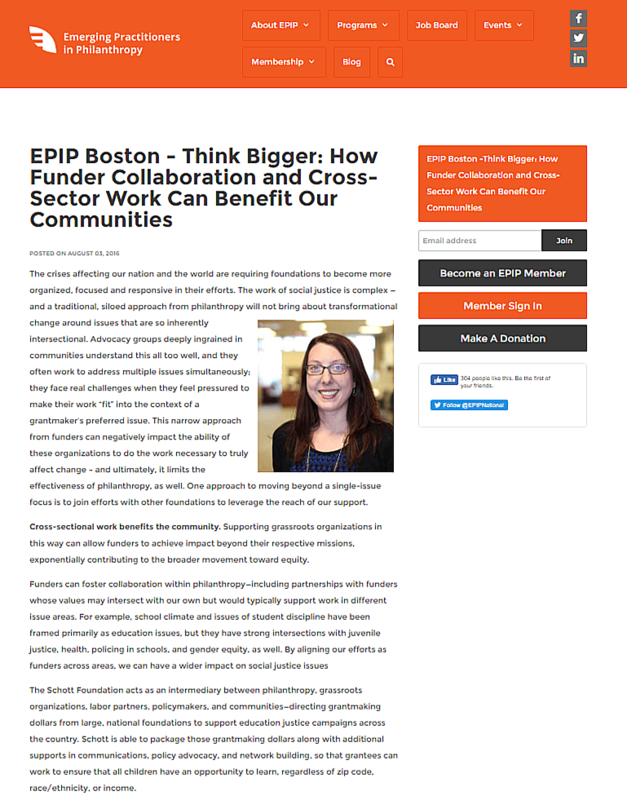 "We had to respond quickly and efficiently in a challenging and constantly changing political environment, where the needs of the grantees were great and growing, which meant we had to come up with a way of doing things differently." 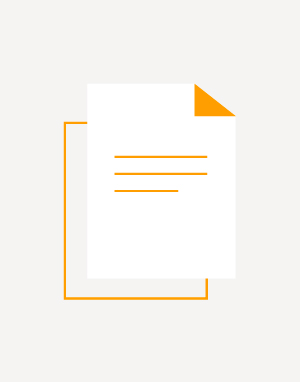 Informed by the experience of the Fund for Immigrants and Refugees, this article provides insight into effective collaborative grantmaking and important lessons learned. Honesty. Communication. Trust. Dedication. Patience. All form the foundation upon which relationships are built. Like any relationship, funding an organization as a collaborative effort—particularly an advocacy organization—requires a solid foundation.